ENT Devices Market size was valued at USD 15.7 billion in 2018 and is expected to witness 8% CAGR from 2019 to 2025. 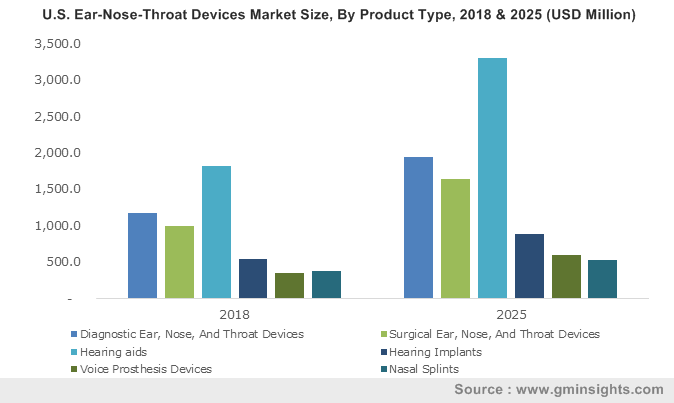 Integration of advanced technology for developing superior quality ear, nose, and throat devices coupled with successful product launch and products approvals by regulatory bodies will drive the ENT devices market growth. For instance, companies have launched hearing aids and amplifiers that can be connected with mobile enabling users to have better conversations over calls as well as allows tracking of mental health and cognitive hearing. Technology integrated in ENT devices also eliminates errors and improves accuracy thus, surging its adoption in the foreseeable future. Favourable regulatory landscape for ENT devices in developed countries will positively impact the industry growth. As the ENT devices industry is in the development phase, companies operational in this industry try to create product differentiation that impacts positively on the company’s sales. For instance, in September 2017, Medtronic launched StealthStation (TM) technology for ENT procedures. StealthStation is a novel surgical system for navigation of ENT anatomy. This technology uses proprietary electromagnetic (EM) tracking technology and the firm received FDA 510k clearance and CE mark for the same. Thus, favourable regulations will enable availability of superior ENT products in the market thereby up surging industry growth. However, high procedural costs may hamper the industry growth to some extent. 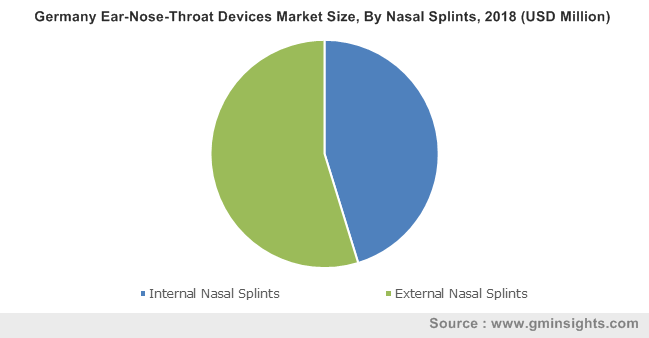 Diagnostic Ear, Nose and Throat (ENT) devices segment was valued at USD 3.5 billion in 2018 and is anticipated to have significant growth during the forecast timeframe. Recently developed diagnostic ENT devices such as technologically advanced endoscopes possess flexibility and efficiency that have high adoption as compared to the conventional diagnostic devices. Therefore, growing demand by medical practitioners for cost-effective, accurate as well as efficient diagnostic tools will drive the diagnostic ENT devices segment growth substantially during the analysis period. Hearing aids segment held considerable revenue share in 2018 and is anticipated to witness 9.3% growth during the forecast period. People suffering from hearing loss are at higher risk of acquiring dementia. Hence, availability of superior quality hearing aids will lower the chance of developing dementia as well as enhance cognitive learning. Also, hearing aids reduce irritation associated to tinnitus that further triggers its adoption amongst people suffering from hearing loss. North America market dominated the industry with USD 6 billion in 2018 and is anticipated to show similar trend over the forthcoming years. Major factors driving the regional market growth includes high adoption rates for technologically advanced devices. Also, developed countries such as the U.S. have high awareness regarding consequences of ENT diseases and availability of procedures and devices to avoid those consequences. 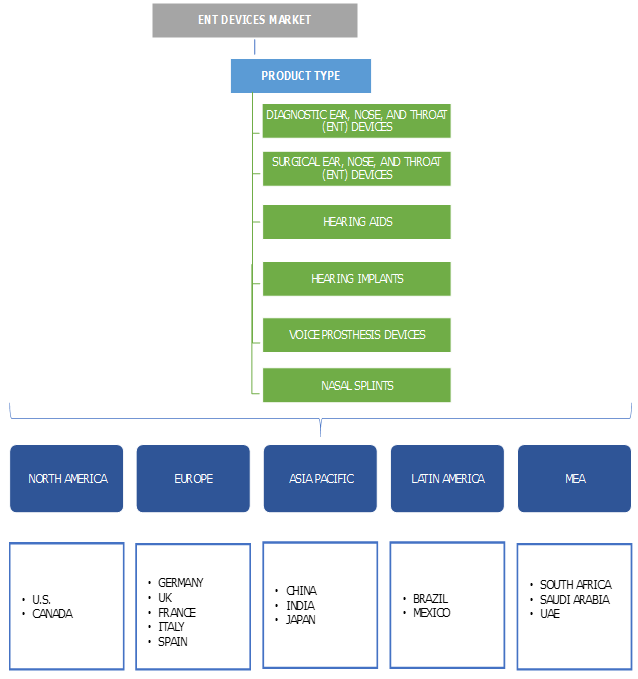 Moreover, the industry has numerous growth opportunities in North America due to presence of favorable trade policies and regulations associated with the ENT devices. Asia Pacific ENT devices market will witness lucrative 9.3% growth over the forecast period due to rising geriatric population. 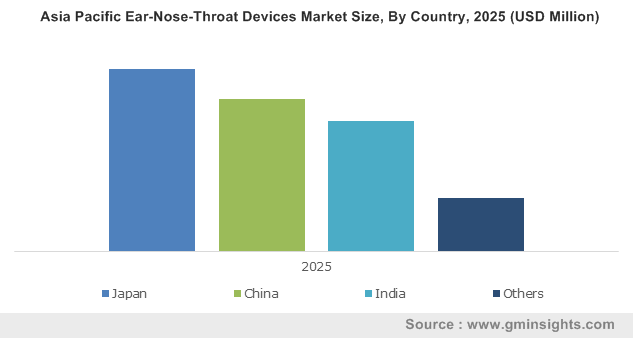 Hearing diseases as well as throat infections prevalent in geriatric population have raised the demand for ENT diagnostic as well as surgical devices that will prove beneficial for the regional industry growth. Moreover, government in emerging economies actively supports development in ENT procedures. Additionally, government has also taken several initiatives to reduce the prices of ENT surgical procedures that will resolve affordability issues thereby, propelling the Asia Pacific ENT devices industry growth in forthcoming years. ENT devices market experiences intense rivalry and key industry players operational in this industry implement several strategic initiatives that enables them to maintain their market position. Key industry players operative in ENT devices industry include Siemen’s Healthcare, Sonova, Cochlear, Rion, Starkey Hearing Technologies, Welch Allyn, Widex, Atos Medical, GN Hearing, and William Demant Holding. These companies implement certain strategic initiatives that enable them to earn sustainable profits. For instance, in July 2017, Cochlear introduced and launched its innovative Nucleus 7 cochlear implant sound processor which allows users to stream sound from their iPhone, iPad and iPad touch further improving connectivity, accessibility and wireless solutions. Introduction of such technologically advanced products will foster Cochlear’s revenue stream. ENT devices industry has witnessed immense growth since several years and this industry can be traced back to early 1900’s. 19th century can be considered as an era of numerous developments in ENT devices and procedures. In 1901, modified endoscopes were utilized by Hirschmann to diagnose maxillary sinus. Later in 1953, Zeiss Optical Company introduced binocular microscope that enhanced the microscopic ear surgery performance. Also, development of cochlear implants started back in 1960. Later in 20th century, ENT industry has experienced drastic revolutionary changes. Few medical specialties suffered several scientific progress and changes in the last few decades. Furthermore, advancements specifically in the field of otorhinolaryngology have led to improvements in radiology, microsurgery and endoscopy. Use of information technology in development of ENT devices has helped in replacing the conventional ENT devices proving beneficial for the industry growth. Furthermore, ENT devices industry is dominated by few players and will experience stupendous growth in developed economies with favorable trade policies. Also, new players willing to enter ENT devices market can penetrate in developing and underdeveloped countries with huge geriatric population and unexplored opportunities.